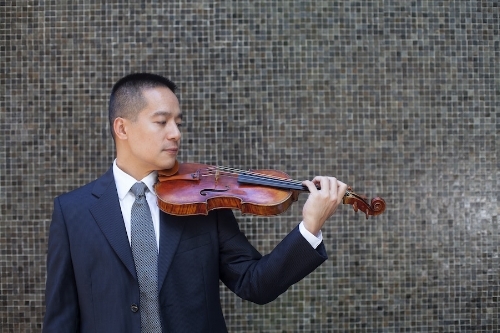 Virtuoso violinist Elbert Tsai leads a multifaceted career as a recitalist and soughtafter pedagogue. He currently serves on the violin faculty of the San Francisco Conservatory of Music Pre-College as well as Center Stage Strings, an Mpulse Institute at the University of Michigan School of Music. Previously, he taught violin and chamber music classes at the Luzerne Music Center, Crowden School, and SFCM Collegiate Division. Elbert’s early career as an educator began as a teaching assistant at Oberlin, Rice University, and the USC Thornton School of Music during his studies at each school. During the spring semester of 2018, he will return to Oberlin as a visiting professor for three weeks. Elbert’s recital programs consist primarily of short showpieces and melodies, spanning the Baroque and Renaissance eras to contemporary music. Showcasing the 450-year history of violin music, this approach hearkens back to the golden age of the virtuoso violinist-composer. His recent performances include recitals at the San Francisco Conservatory of Music, Three Rivers Performing Arts Institute, Scripps College, Le Petit Trianon Theatre, and Colburn School for the Performing Arts. As a soloist, Elbert has appeared with the Bear Valley Music Festival, Oakland Opera Theater, National Repertory Orchestra, and Sacramento Symphony, often performing concertos featuring his own original cadenzas. Before embarking on a solo and chamber music career, Elbert performed as an orchestral musician. In his first year as a professional, Elbert joined the San Francisco Ballet orchestra, where he also served as Assistant Principal Second Violin for two seasons. He would later win a position with the San Francisco Symphony, sharing the stage with many of the world’s greatest conductors and soloists and touring renowned concert halls in the United States, Europe, and Asia. Elbert also performed for several seasons with the San Francisco Opera and the Pacific Symphony in Orange County. He has held numerous concertmaster and guest concertmaster positions, including with the Festival Mosaic orchestra, Modesto Symphony and, most recently, the Bear Valley Music Festival. As an orchestral musician, he has also participated in the music festivals of the Sun Valley Summer Symphony, Aspen, and the Tanglewood Music Center.